Members of Old Schoolhouse Magazine’s Review Crew were offered two games from USAopoly to play, learn, and review. I received Tapple: Fast Word Fun for Everyone and Wonky: The Crazy Cubes Card Game. Both are suggested for ages 8 and up. While Ruby is only 7, she attempted to play too. Wonky worked well for her, (As a good reader, she did fine – she lacked strategy, but had fun nonetheless.) but Tapple was difficult for her to keep up and she didn’t enjoy that one so much. 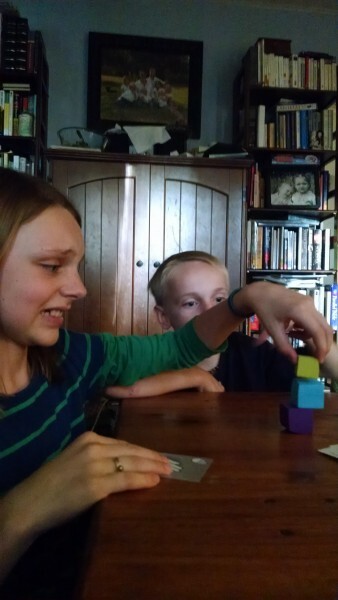 The other three of my older children, ages 12, 10, and 8 enjoyed both games. We tried Tapple first. 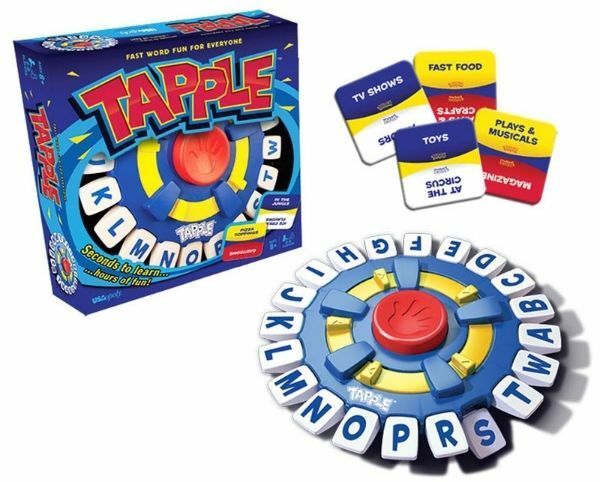 It got everyone scrambling, trying to pick a word in the selected category that began with a letter not taken on the wheel – all before the buzzer went off! This one had tempers flaring in my house a bit more than I liked, but they learned to play together and extend grace when someone chose a bland adjective for the fifth time in a row… it made it frustrating for me, but the kids loved it. I just learned to stay out of the game and let them play. Learning how to play was fast and easy – but mastering it takes skill! This one teaches its players to think on their feet, to work quickly under pressure, and caused many a discussion on what exactly an adjective is! Wonky was a huge hit with all four of my older children. We each were dealt seven cards, and had to pick one from our hand and follow through on its instructions. Each card, with a few exceptions, tells of a block (or gives freedom of choice) to stack next. A few cards allow for skipping turns, reversing play, etc. 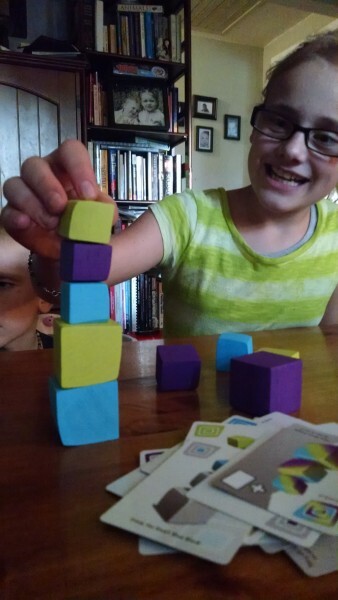 We only once have managed to stack more than five blocks high before it topples – they aren’t straight and square! You may choose whichever side of the block to place up/down, but be careful! They aren’t exactly straight and things get a bit, well, Wonky! This game was much loved by all of my players, but particularly spoke to Sterling, age 8. His inner architect was determined to figure out how to stack the blocks taller than we’d decided was even possible, and his strategy was impressive. 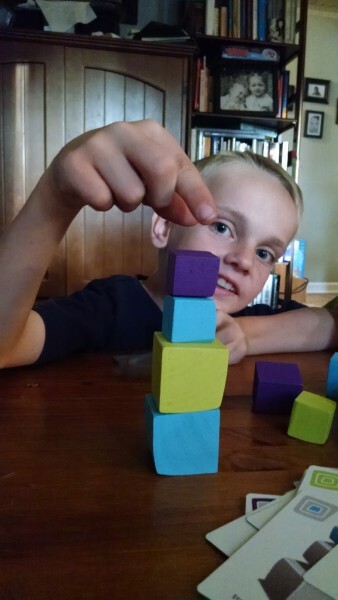 I’m pretty sure, with as hard as he was working to figure out just how to stack the blocks, that it should count for math study. He loved every minute and it kept him thinking on how to stack it best. I cannot recall him ever being the one to topple our tower. The game lasted a good long time with five of us playing, but the kids were always still disappointed when it was time to put it away. It’s lived on our coffee table since it arrived a month ago… you know, just in case we have a minute to play. On the bright side, my coffee table has never been so well cleaned off regularly. It’s definitely a hard-surface-necessary kind of game. 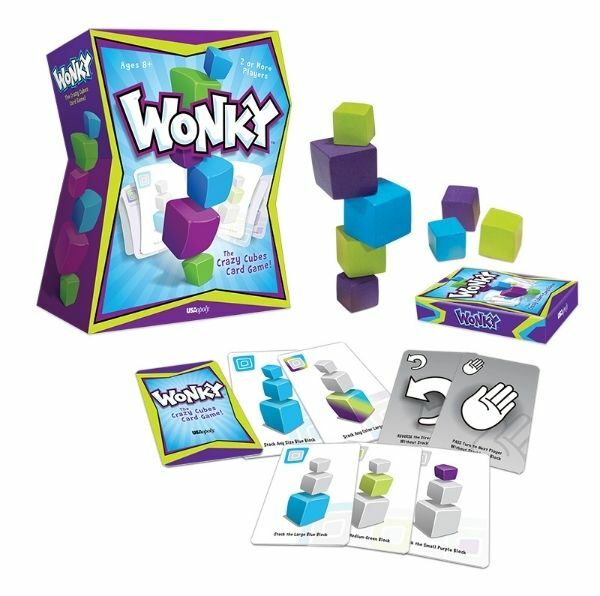 USAopoly offers Tapple and Wonky on their website. Each game retails for $19.95. USAopoly can be found all over the World Wide Web. Find them on Facebook, Pinterest, Twitter, and Instagram. Liberty took this game seriously… maybe too seriously! ← Charlie’s five and Ellie’s a mess.